When it comes to food, I have, without a doubt, been influenced by the women in my family. And my grand aunt Sharada, was one amongst these women. 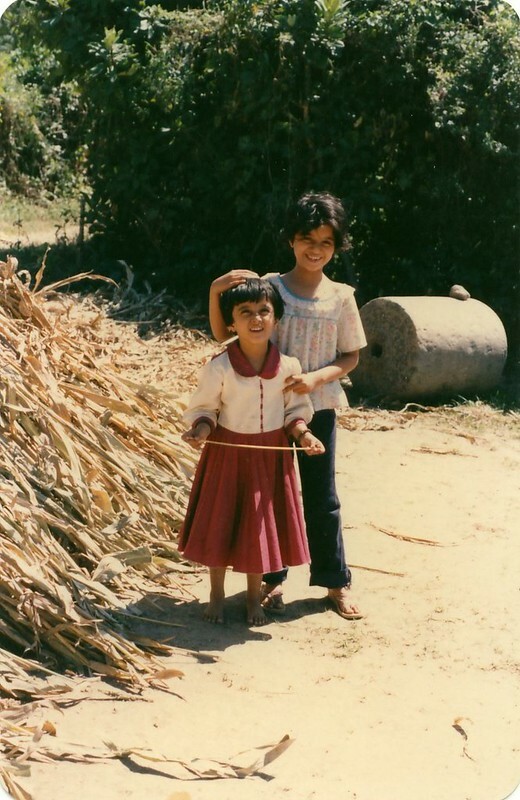 I visited my mother’s ancestral village quite often in my early childhood. 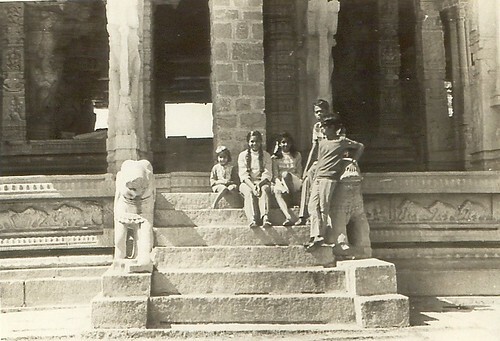 This was the place she and her siblings spent many eventful days and holidays, playing in the fields, eating mangoes and other fruits right off the trees and interacting with other village folk. I got to hear many stories and live a part of this life until my maternal grandfather passed away at my age of eight, after which my visits to this place drastically reduced. 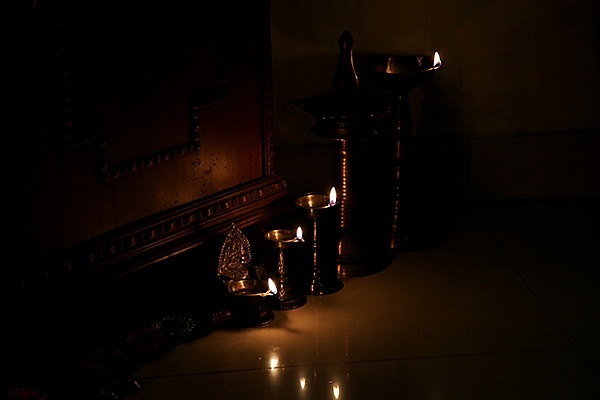 It was in the ancestral home in this village that my grand aunt Sharada lived. 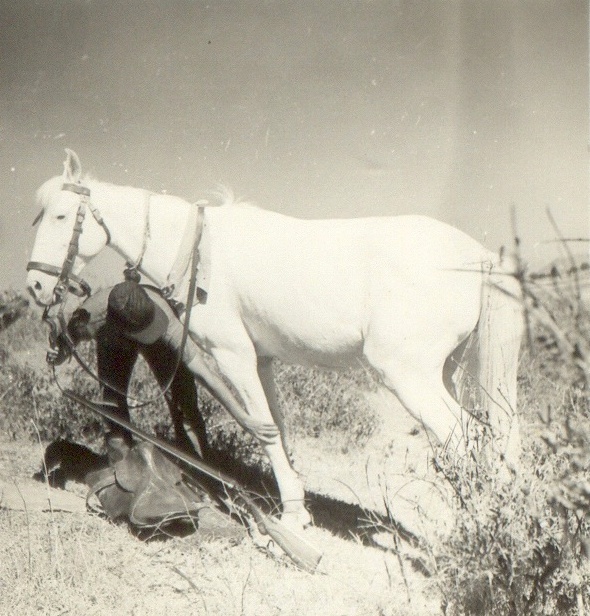 She was the wife of my maternal grandfather’s 2nd brother. She belonged to the generation of women who spent a major part of their life cooking to feed family and friends. These women cooked daily meals, ritual meals and festive meals with enthusiasm, carefully selecting the best ingredients and served food to whoever came their way, with much love and dedication. Fast forward to the year 2009, when I spent a few months in my mother’s home after Hari’s birth. Amidst the stream of visitors that came to see the new born, friends, well wishers and relatives, what lingers in my memory is the food that some got along. 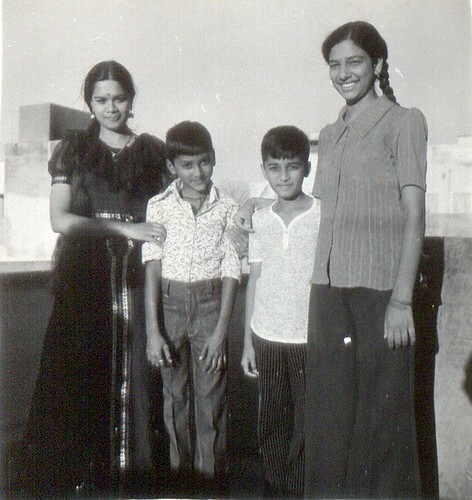 My grand aunt Sharada whom I used to lovingly call kaku ajji, came too alongwith her husband. 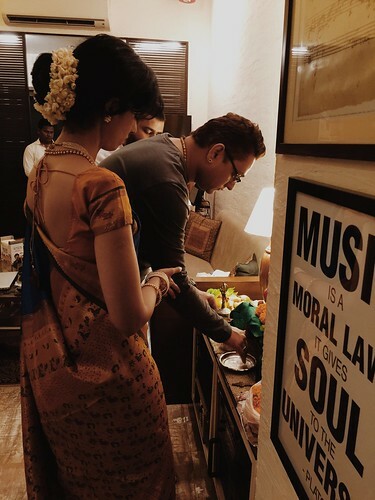 And she brought with her the best antina undi, (known in Marathi as dinkacha ladoo, a laddu made with jaggery, coconut, edible gum and dry fruits) that I had ever tasted. Traditionally this laddu is prepared and given to the new mother and is a very important part of the first few months of post natal diet. Kaku ajji’s visit reminded my mother about the delicacies she used to make for Diwali and she asked me to take down the recipes of kari gadubu (a fried delicacy also known as kadabu) and this chivda. 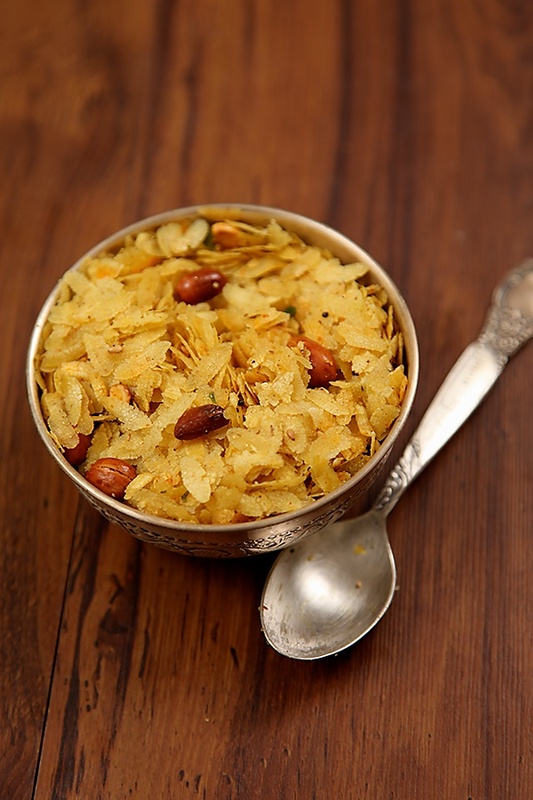 Legend has it that this chivda used to be stored in big containers in the kitchen and served to all guests and visitors along with other homemade delicacies. And family members used to help themselves to helping of this chivda topped with fresh homemade curd made from the milk of cows in the backyard. This Diwali, I made my much loved Besan Laddus and this chivda and served it with other sweetmeats and hot samosas to the guests who visited the studio for the Lakshmi pooja. Circa July 2015, my last meeting with kaku ajji. She lay on the hospital bed and everyone around knew that death was lurking around the corner. But her face still radiated positivity and hope. And her eyes shined with the innocence of a new born child. 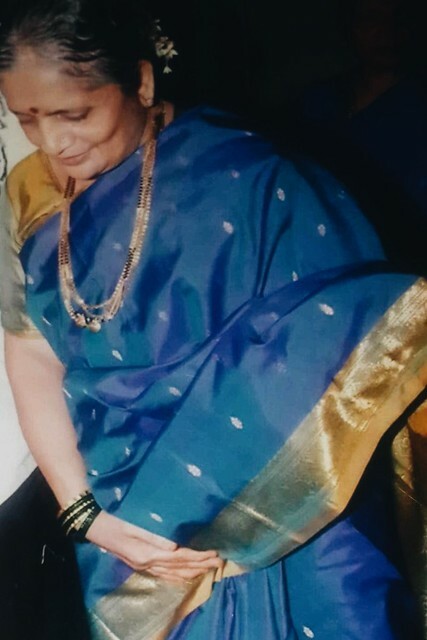 When I told her that the laddus she had prepared for me during my post natal period was the best I have ever had, she smiled and replied that the taste was due to homegrown jaggery and coconut and homemade pure ghee. To which I replied saying, top quality ingredients are crucial for a great dish, but only a good cook knows how to transform those ingredients into something delightful. Although she was in severe pain, she spoke about my work, remembered the name of my website and bits of my childhood. She wished me all the best and told me in chaste English “Just like the eyes are the windows of the soul, the face is the mirror of the heart”. Whatever you feel is reflected on your face. Those words had profound meaning for me as I do a lot of work in front of the camera these days. And then she switched back to our mother tongue and told me how uncomfortable she was and that she couldn’t wait to get back on her feet. Exactly after a week of my meeting with her, I got the news that she is no more. I do regret not having been able to capture her simple beauty and innocence on my frame. Life and death are a part of life, but I feel grateful that I was able to capture a piece of my grand aunt Sharada’s culinary history and legacy through this post. Dry roast the poha for 3 to 4 minutes. Transfer it on to a large plate and after it cools down mix in the salt, ghee, chili powder and coriander and cumin seed powders. 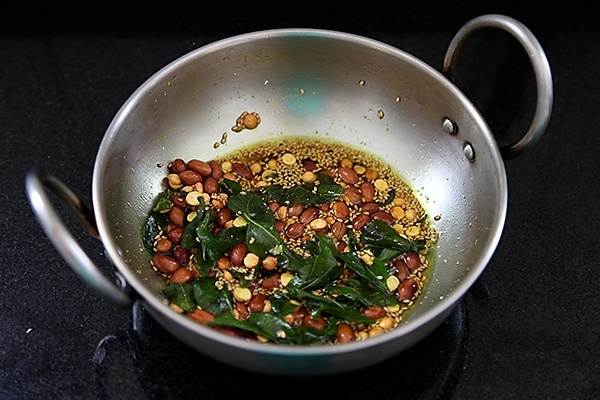 Make the seasoning- Put in the oil and after the oil is warm enough, pop in the mustard seeds, the roasted dal and peanuts. After the mustard splatters and the dal and the peanuts turn golden brown, put in the sesame seeds and the curry leaves. 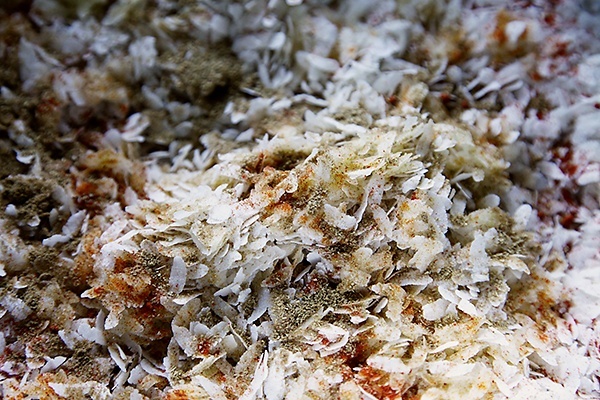 Once the curry leaves are crisp, stir in the asafetida powder and the turmeric powder. 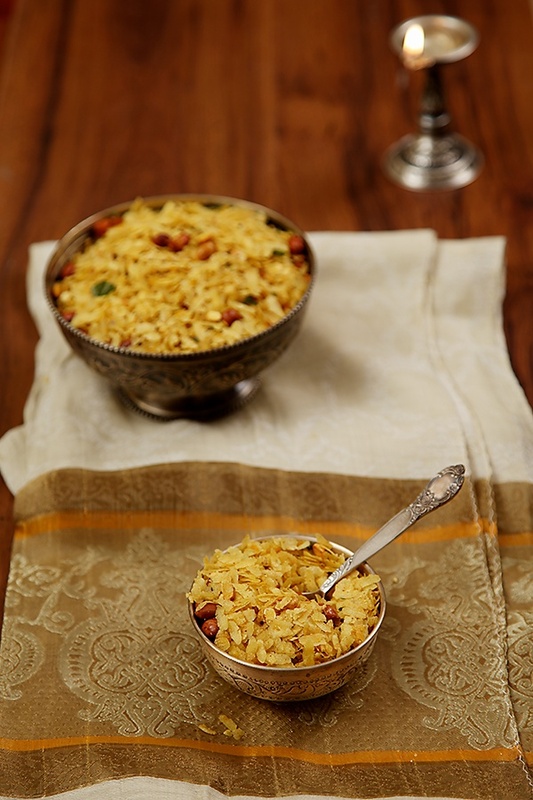 Stir in the spiced poha and roast on low heat for 8 to 10 minutes, until the poha is crisp. Turn off the heat, allow to cool and store in an air tight container. Tastes great with chopped cucumber or tomatoes or both. You can also eat this mixed with some yogurt. Appreciate the way you captured your family history; it's crucial role in your current journey into the culinary world. Your Ajji has also caught a special place in our hearts , though you were more lucky to taste her homemade ladoos. Happy cooking and writing. Smiles. Lovely post. 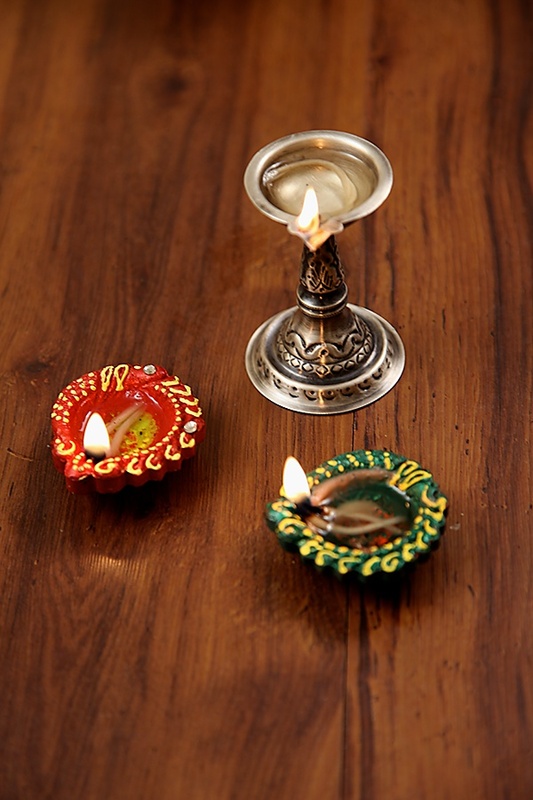 Beautiful presentation of chivda in silver bowls. Thank you for the effort you put in behind each recipe, the write-up and the photographs. 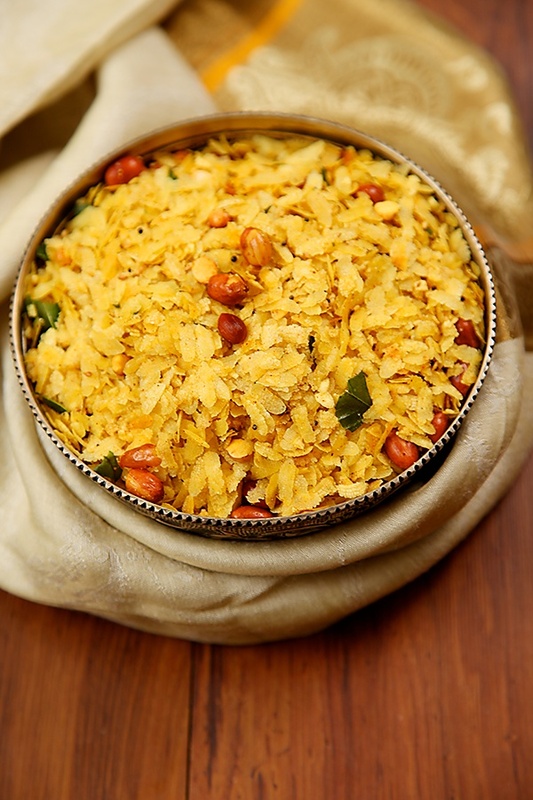 I love chivda and would love to try your recipe. 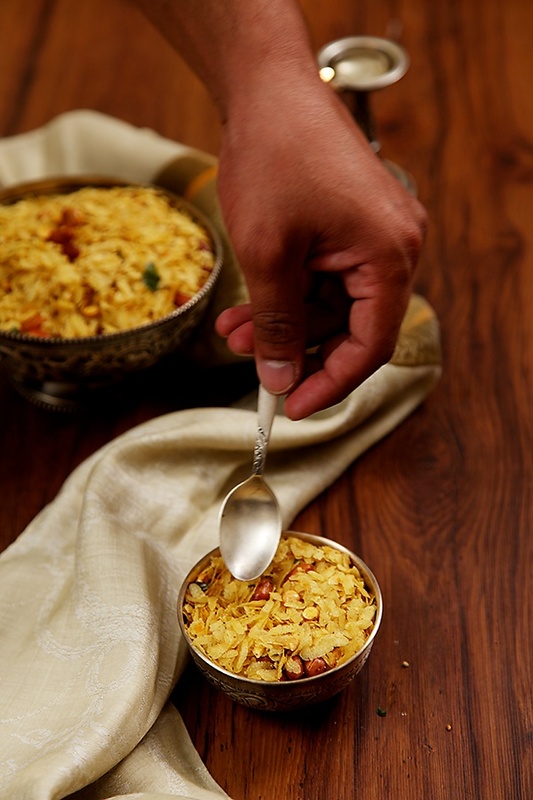 Have you used thin poha here or is it thick poha? Your post made me nostalgic. Cows' milk from the backyard-wow! What a colossal loss of our wonderful culture and wholesome way of life!! I like your presentation and explanations and have bookmarked your site. I enjoy going over the pictures and your vignettes of the personalities that shaped your art. I was first impressed by the huli pudi of your beloved ajjima and now this chivda has entranced me. I will make this soon. The beauty of the product is the meditative way of gathering together the ingredients, then going through the process slowly and carefully. This has a special and delicate charm. Perhaps that's why the taste is also so perfect and unique. Pratibha- Glad you liked it! Jayashree- Thank you for taking the time and giving me your valuable feedback! I have used the medium variety. Not very thin and not thick. mona- Very well said! I'm happy to know that you appreciate the nuances and finer aspects of cooking. Please do visit again. I look forward to hearing from you again. Tried chivda for evening snack yesterday, came out real good. And even more yumm with yogurt. Loved it, thanks. Namitha- Happy to know that. Thanks for the feedback. I was looking for this recipe since v v v long,as my childhood friend's mom used to prepare this often n had tasted at her house during those childhood days n liked it v much with yogurt then,so I am fond of it n wantd its recipe anyway always,as my old friend went out of touch v soon after that.Thank you so much for sharing this recipe.Your recipes r really valuable n v useful for me as they r special of v yummy dishes.I had tried your sesame seed chikki recipe,it came out perfect n I enjoyed it thoroughly.Thank a lot for the help n whole effort you put it.I hv been watching your videos in Rajshri Channel on youtube. Sonia- Thank you for the feedback. Look forward to hearing more from you.